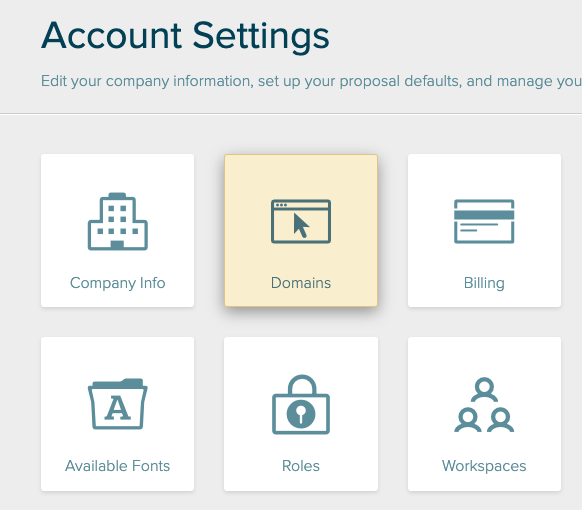 Looking to remove "domain.proposify.com" from your proposal URL? This quick guide will walk you through the steps. Your proposal should be about two things: Who your client is and what your company can do to help them. We give you some tools to help get that across. If you don't like seeing our name in your address bar; don't worry, we're not offended! Here's a quick guide on how to customize your URLs to make it REALLY about your client and your company. YOU'LL NEED TO RE-SEND YOUR PROPOSAL LINKS IF YOU CHANGE OR DELETE THESE SETTINGS. Once you change your domain, we won't be able to redirect old proposal links to the new URL. If you’ve sent a proposal and then change or delete your domain, the old link will no longer work. You'll need to send a new one. While we do provide a guideline on how to set this up, you may not have access to your domain settings. If you're in a large company, you may need help from your friendly neighbourhood IT person. 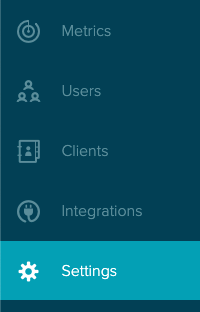 We can keep up-to-date on UI changes for Proposify; we can't do the same for every registrar, though. If you can't find exactly where to go, check with your provider's support documents. Not sure where to look? Check with our support team and we may be able to point you in the right direction. Now that we've got the scary disclaimer stuff out of the way, let's get started! The first thing you'll need to do is add a CNAME record to your domain registry. It sounds super technical, but it's really super easy. Go to your DNS settings page for your domain, then click "add record". From the "add record" menu, select CNAME. This will set up an alias from your domain to ours. Think of it as a mask with this layered on top of our service. Host Name (or Host): This is the name of the redirect. If you want your proposal URLs to say "proposals.yourdomain.com" then "proposals" would be the hostname. Choose whatever you'd like. Points To: This is the stuff behind the mask and should point to us. This should say "ssl.proposify.com" (without the quotations). TTL: You can leave this at whatever it's currently set at. Once you've entered these details, click "save". The complicated part is over. Now we need to tell Proposify to use this record. Here, enter the URL you'd like starting with your hostname, then your domain. 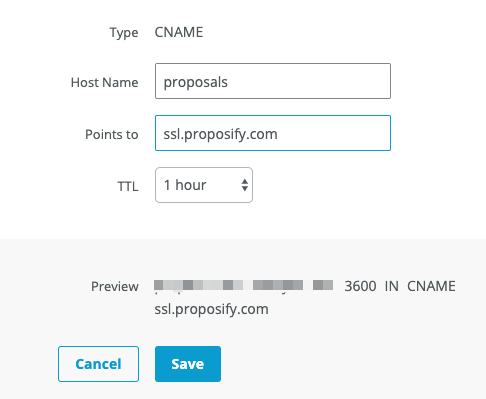 If I set the hostname in my CNAME record to "proposals" then it should be "proposals.mydomain.com". Once you've entered this, hit "Save". It could take a while for our servers to touch base, but all the hard work is complete! Any future proposals will have your own branded URL attached.